As we in currently in holiday mode I thought I would take you on a virtual visit to a garden some time ago, in a country far, far away. Today’s destination is Namba Parks Garden in Osaka. Namba Parks is a complex of shops and gardens in Osaka, located next to the Nankai Namba station, where the train from Osaka Airport arrives, which is how I came to find it. Directly above the station is the hotel where we stayed on our first night in Osaka. Looking out from our hotel window the next morning I was struck by the view, not just the ‘far as the eye can see’ city of Osaka itself, but the more immediate sight of a dramatic vertical building next to a rhythmical curving complex of gardens. 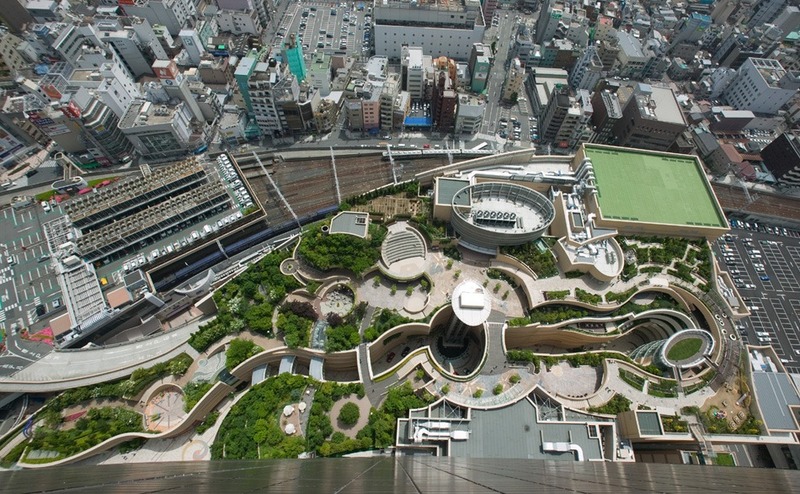 This was my introduction to Namba Parks and what a fantastic way to see the gardens as you could get an idea of both the overall design as well as the vertical depth of the complex which ranges over 9 levels/floors. From up here you could even get a hint at the paving which echoed the curving walls of the gardens. I spent some time trying to draw the gardens, an exercise which showed me that the interest in the design lies in the complex curves, repeated in the paving and in banded colours details in the walls. The levels stacked one on top of the other, move forward and retreat, the curtains of vegetation confounding any attempt to grasp the design in one pass of the eye. Vertigo warning For an even more gut wrenching view here is the designers ‘aerial’ image taken from the Namba Parks Tower (yes you are looking down the building’s outside wall (immediate foreground). On the street level the view is even more luxuriant. Unfortunately the shopping hours in Japan meant that our ability to explore the gardens fully was completely frustrated. The complex doesn’t actually open until quite late in the morning (about 10.00 am and we had another train to catch), so we could only check out the ground level and look longingly up at those stairs where the rope stops would-be early morning interlopers. 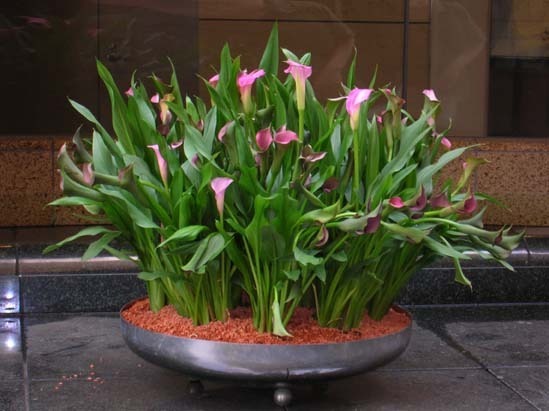 along with more elegant planters filled with pink lillies. 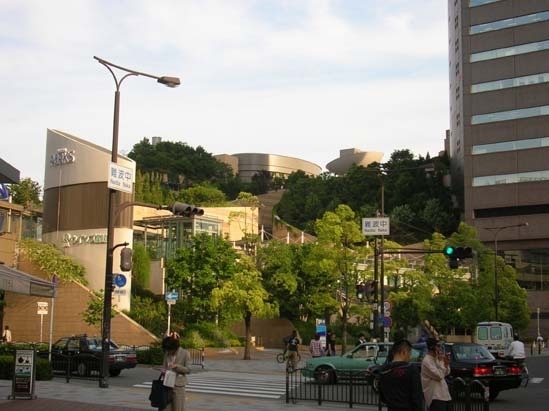 The Namba Parks complex, completed in 2003, was designed by US designer Jon Jerde. Late last year (2009) I discovered my first purple passion, the beautiful eggplant Prosperosa at the Allsun Farm open day. First I was seduced by its flowers and then by its wonderful fruit. During the 2009-10 summer Elspeth Thomson encouraged this interest with her tales of her purple garden plants and the almost mystically regarded (well by the English at least) purple sprouting broccoli. As Hugh FW is also a devotee of this veg it was only a matter of time before I too succumbed. The plant well and truly delivered this spring. This year has also been the year of the Purple Podded [climbing] Pea. Please be careful as there are both English and Dutch purple/blue pea varieties to be found on the Lost Seed catalogue. 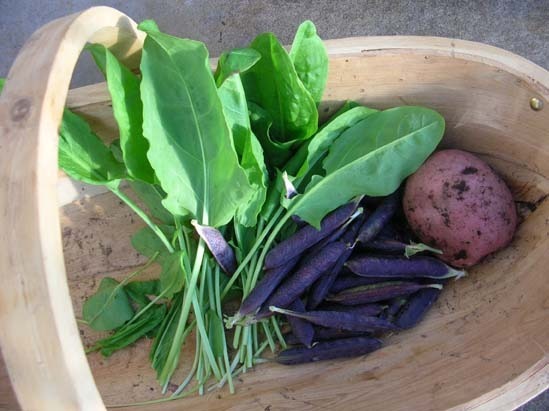 I choose the English variety Purple Podded (although to confuse matters I had actually intended to select the similar Dutch variety called Blue Podded Capucyer). To start off with the flowers were a combination of pale mauve and dark purple followed by purple pods. Inside you find a fat pod of bright green peas. This is a proper cooking pea and definitely not one that can be eaten like a snow pea. You can see why I love this colour combination. I also collected some of our first Red Norland potatoes ‘bandicooted’ out from the end of the potato bed and some sorrel (springing back after its’ recent haircut) to make a basic pea soup. 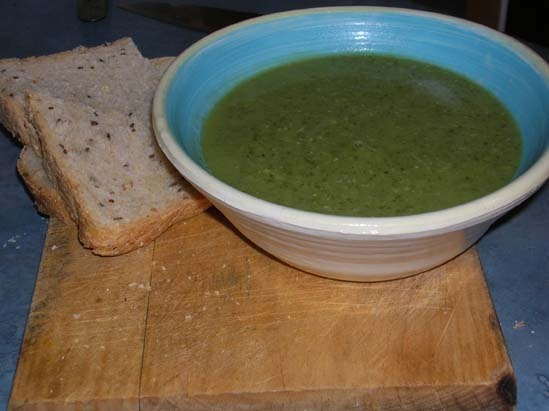 So yet another ‘green soup’ but a pleasant and simple meal at the time of the year when rich food is the order of the day. May your veggies grow well and the snails stay away. May all your cooking turn out tasty! 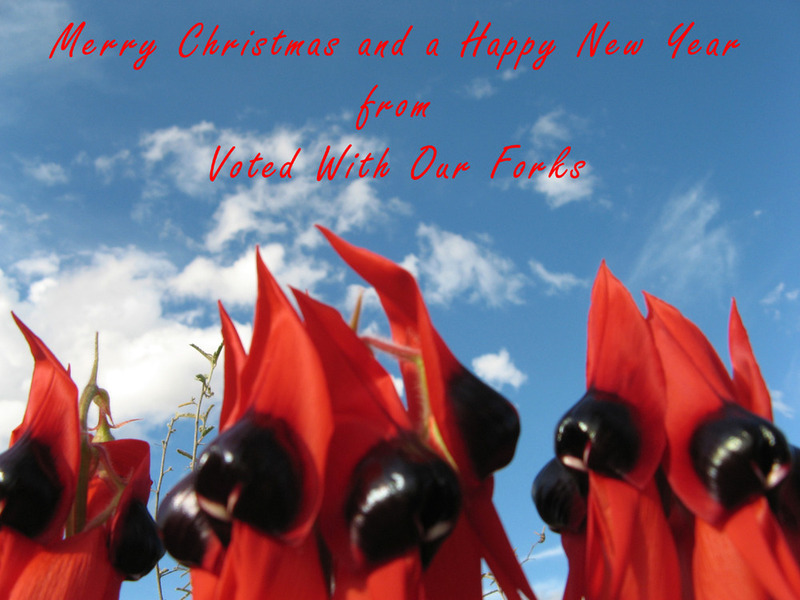 Christmas time in Australia can be very confusing with a head-on collision between living in the Southern hemisphere and the images of snowy winter weather that dominate our Christmas cards, not to mention our TV screens at this time of the year. Thinking then, about what the perfect Christmas tree is can tie you in knots. This is a lovely specimen of Grevillea robusta, one of several plants in this genus that grown up to be magnificent trees rather than just straggly shrubs. At this time of year they are covered in the most beautiful golden flowers. I have a great fondness for these trees as my grandparents had an even larger specimen in their garden in Sydney. 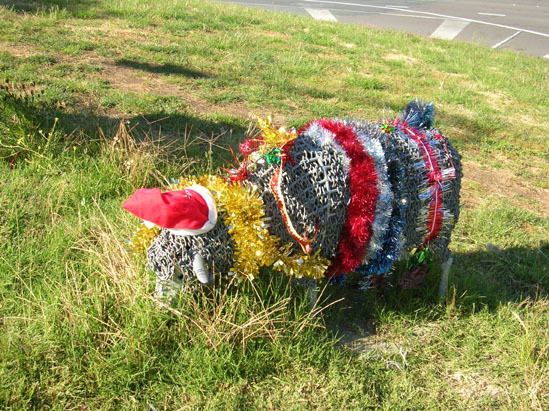 It may be too big to get into your house (this one would be over 6 metres high) but what a way to celebrate the season. 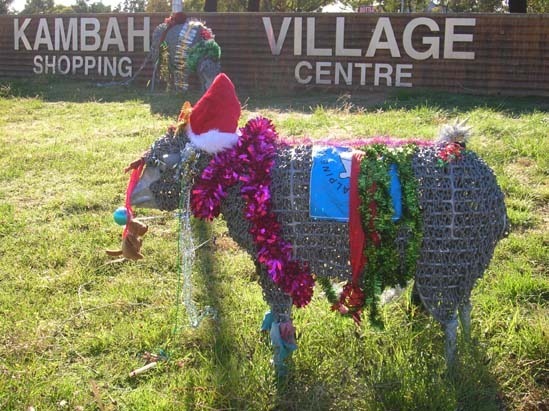 Each year around Christmas, as we pass Kambah Village shops, we keep an eye out for that special moment when the sheep get decorated! Today was our lucky day. others just wanted to keep their heads down. 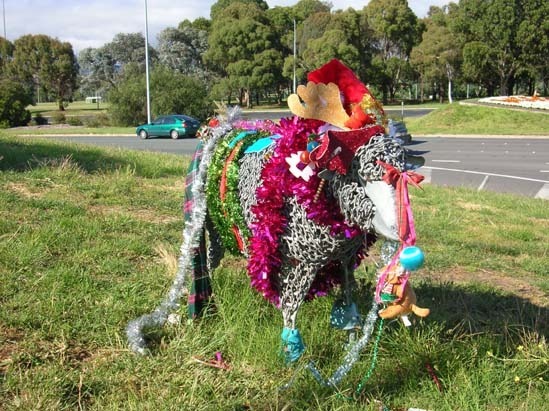 I think this sheep couldn’t make up its mind whether it was doing Christmas or a South Pacific cruise. … and thank heavens for that we all say! 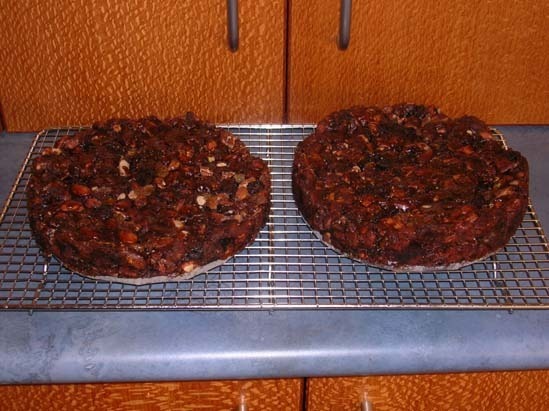 Apart from making lots of cheese lately, TB decided that it was probably time to make some Christmas cake. Of course he decided he needed to make several Christmas cakes. So he ended up with one really large mix. Sadly the old wooden spoon just couldn’t cut it so it turned out to be a ‘hands in’ experience. It was also really good that he had his wok ladle to hand. 5 cakes were made in all. Sadly we forgot to take a photo of them when they came out of the oven. Inspired by the season and having had a good read of the Canberra Times Food and Wine Christmas Recipes (8 December 2010) I decided to have a go at Matthew Evan’s Panforte – from his book The Real Food Companion. 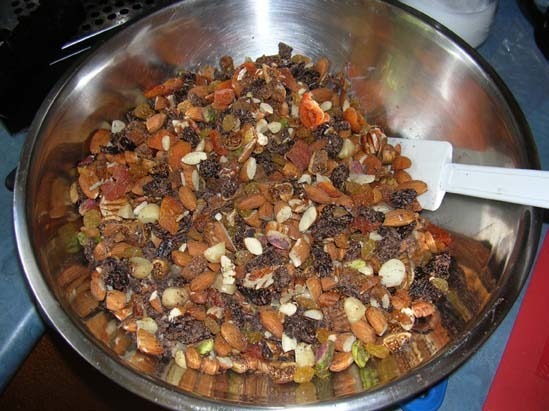 Firstly take a lot of fruit and nuts (1.5 kgs of fruit and nuts, coarsly chopped up), to which you mix in 1 tablspoon of ground cinnamon, and 1 teaspoon each of cloves, nutmeg, mace and allspice, add 75 gms of grated dark chocolate and 240 grams of plain flour (sifted). In a saucepan heat 250 grams of caster sugar, 2 teaspoons of golden syrup and 300 grams of honey. Whisk them together until dissolved and then simmer for a further three minutes. While the mix is still warm add the melted sugar mix into the fruit and nuts. Start stirring, or better still find someone strong to do it for you. Once the mix has cooled you can get stuck into mixing it with your hands – it would be a good idea to oil your hands before you get stuck in – because stuck was the operative word. I have never wrestled such a sticky mixture before in my life and I can tell you it was a close run thing. (No photos were taken of this stage – I don’t want to put you off completely). 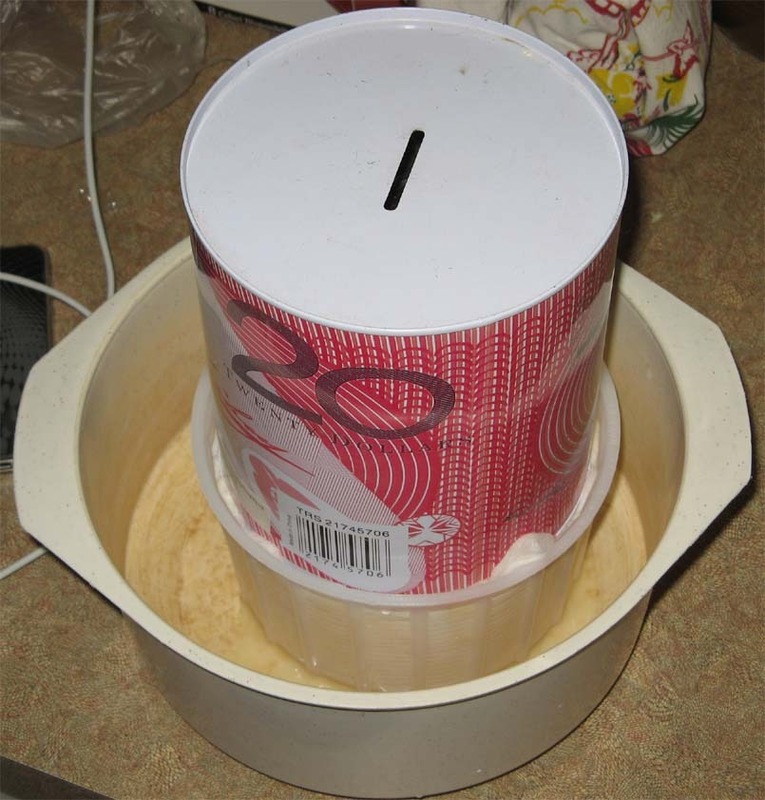 Anyway this is a big mix so you will need two round 20 cm cake tins to cook the mix. Cook in a 180 degree oven for 20 minutes. 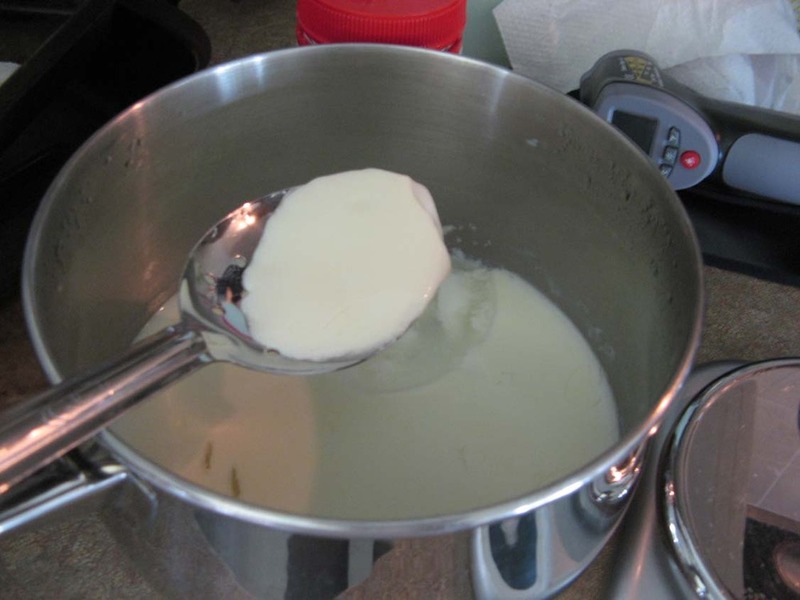 The mix only really needs to heat through and should not darken noticeably – there is no way you can get a skewer in to test the mix. Allow the ‘cakes’ to cool and set slightly before removing from the tin. This is a really rich mix and is very filling so you cut it into thin slices to serve – just don’t tell your friends that there is a second one hidden elsewhere in the house. 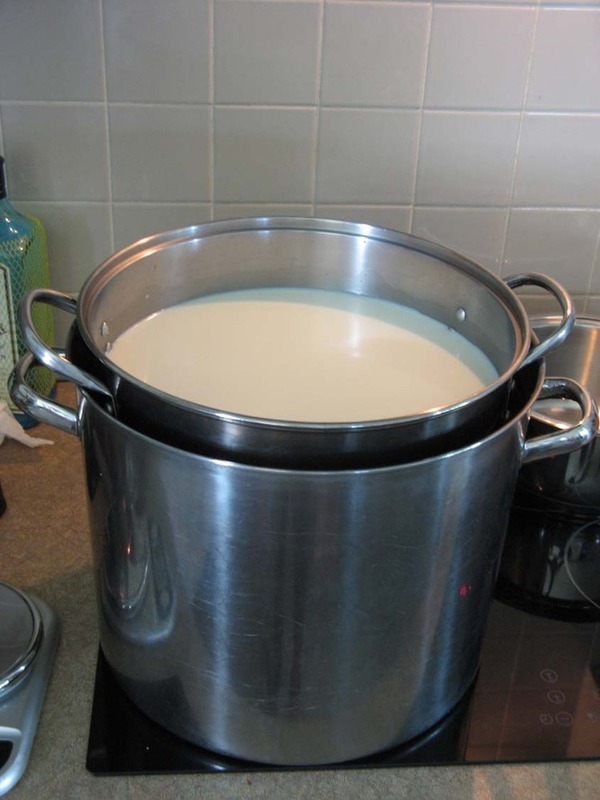 Following on from my earlier post, TB on his return home from the Hunter Valley has been making more cheese, courtesy of 14 litres of Snowy milk that came home with us in a very large esky. We are using a small refrigerator as our ‘cheese cave’ which has been set on a fairly warm setting (well for a fridge that is). This time he made three small soft cheeses and another hard cheese which we hope in time, will transmogrify into something resembling a ‘blue’ cheese. 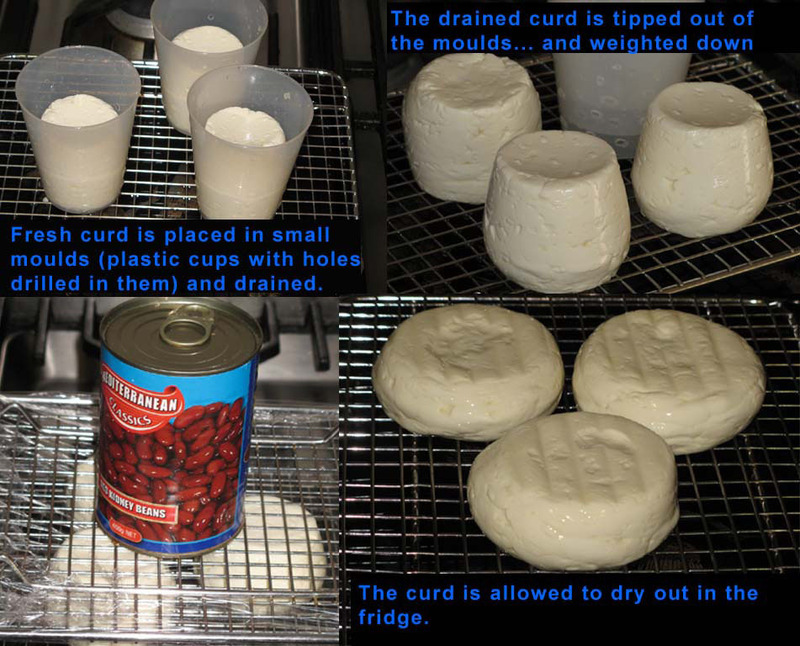 I’m picking up the story at the moulded curd stage so you can see the three small soft cheeses’ progress. These cheeses can be eaten with only a limited maturation time. Last Saturday we ate one of these soft cheeses as cheese on toast for lunch, along with our first tomato of the season which was actually from my sisters garden in the Hunter Valley, not our own. The taste of the cheese was mild but pleasant. The most disconcerting thing was that in texture there was a strong resemblance between what TB produced and a certain manufactured cheese that comes in a blue box and can survive unrefrigerated, we are guessing, for several years. Having dried out some more TB has taken all the cheeses out to salt them. This helps in several ways. One it draws more moisture from the cheeses, two it helps the flavour and three it helps stop nasty ‘bugs’ growing on the outside surfaces. The cheeses are placed on bamboo mats to allow any moisture to fall away from the cheese when it is back in the fridge. At about this time last year I was posting about my Christmas reading and in particular about a book by Elspeth Thompson called A Tale of Two Gardens. In an article in today’s Panomrama I have read that Elspeth committed suicide in March this year leaving behind her husband and young daughter. I was shocked and saddened to hear of her death. I had really enjoyed reading her book, which I had picked out ‘on spec’ at Cloustan Hall, and was hoping to read more from her. Now I will track down her other books and go back and read her blog about converting the two railway carriages she and her husband had bought on the South Coast of the UK. If you would like to read her work you can pick up the story of her railway carriage home starting here check out her website here and following it over to her blog Off the Rails. This is a Brown Swiss. Snowy and young Sutton Hall. With a calf at heel there is plenty of milk for both the calf and the rest of us. This has resulted in lots of fresh milk for breakfast, not to mention lunch and tea and all breaks in between. 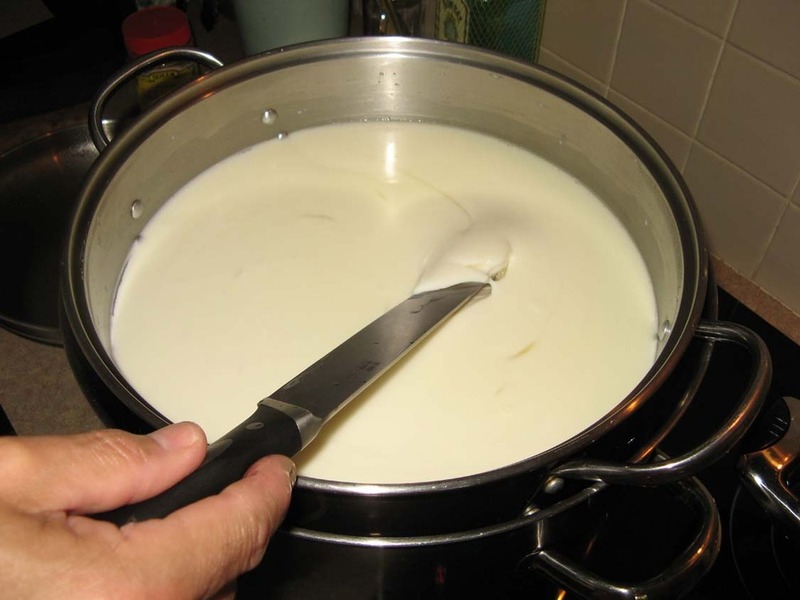 TB who has tried his hand at cheese making on numerous occasions couldn’t wait to have a go with Snowy’s milk. 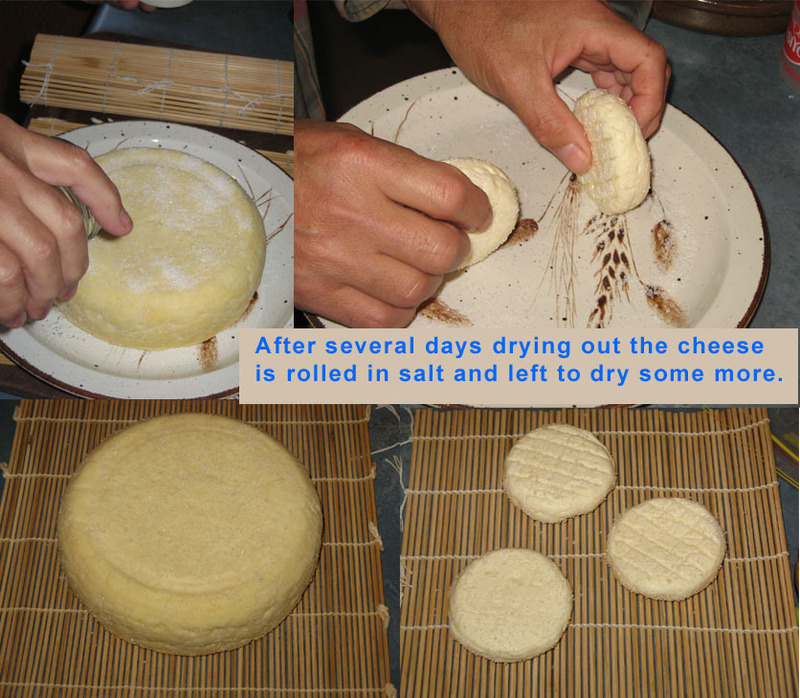 So last Saturday he started in with making a cheddar cheese. 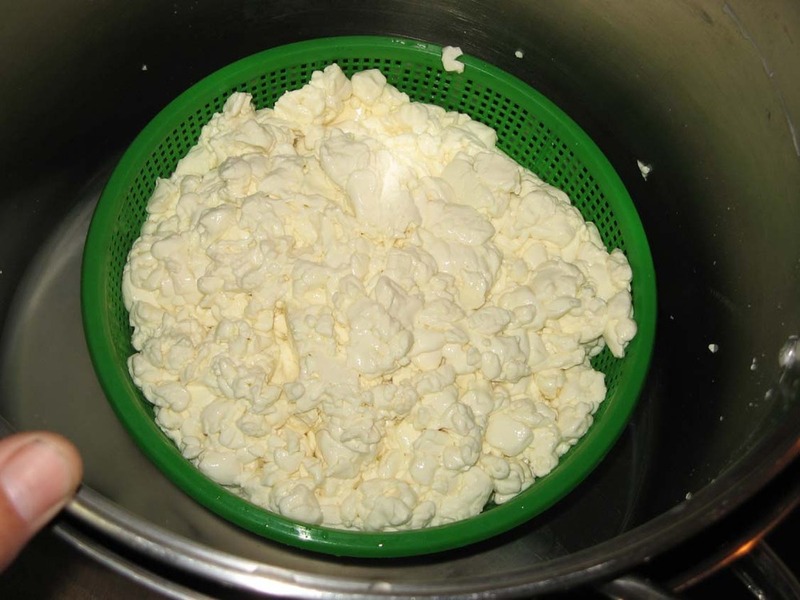 My not very technical summary follows but serious aspiring cheese makers should find a book on the subject, such as Cheese Making Made Easy, by Ricki and Robert Carroll. 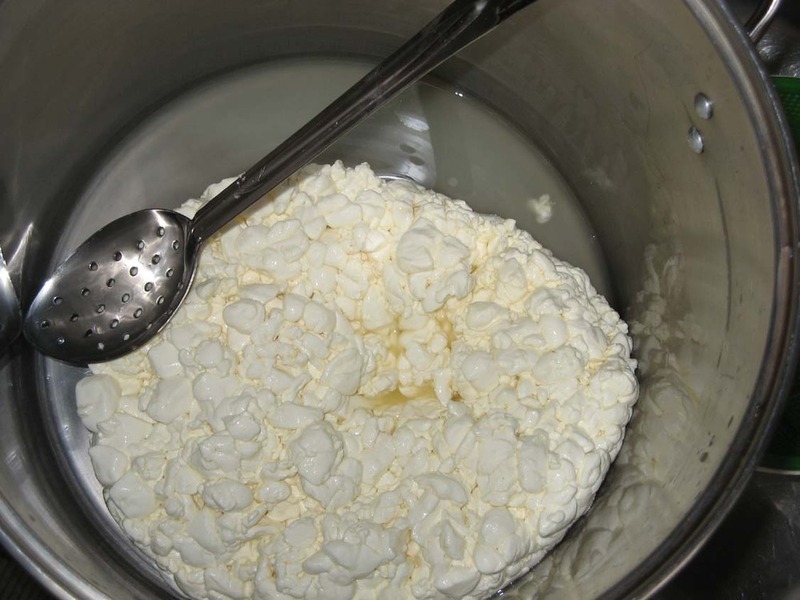 Another good resource is Cheeselinks which is an Australian supplier for cheese and youghurt makers. 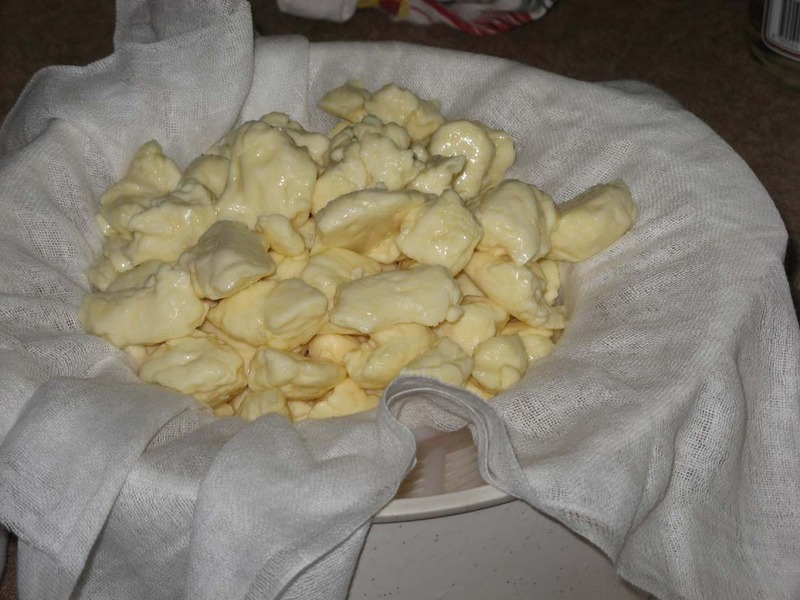 Budding local cheesemakers may also be interested in workshops offered by Small Cow Farm, 2011 classes are listed on their website. Here we go. First take 10 litres of milk. Here is the starter, somewhat like yoghurt, which is added to the milk. 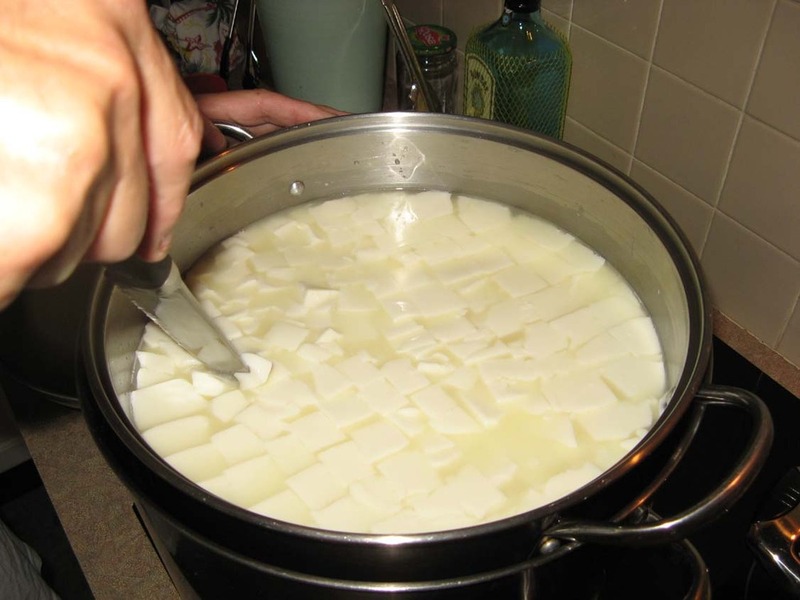 and then the rennet is added, which coagulates the milk (about 30 to 45 minutes). 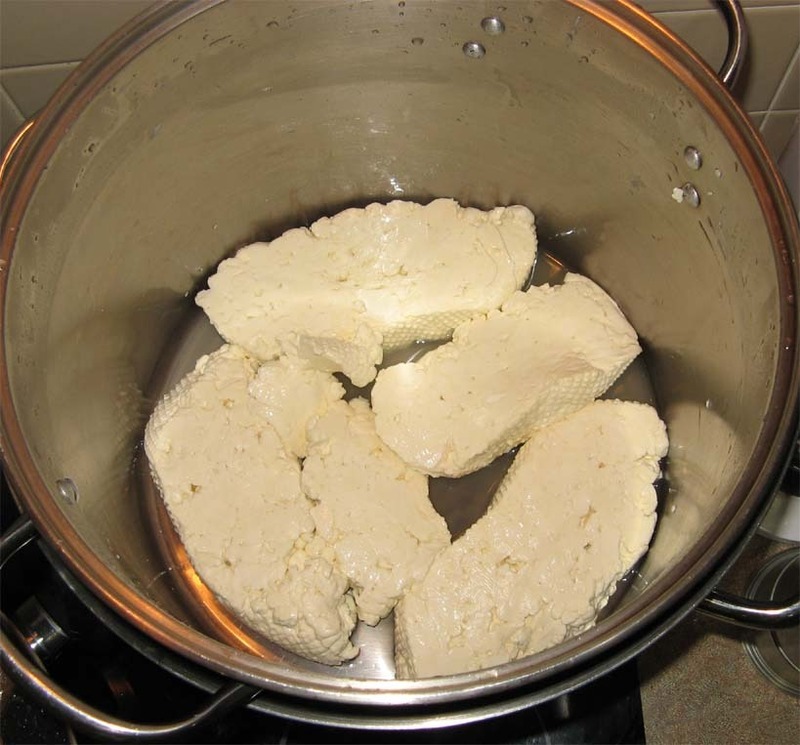 the curds then sink to the bottom of the pot and are cooked at a low temperature for another hour (the temperature is only raised from room temperature to luke-warm). 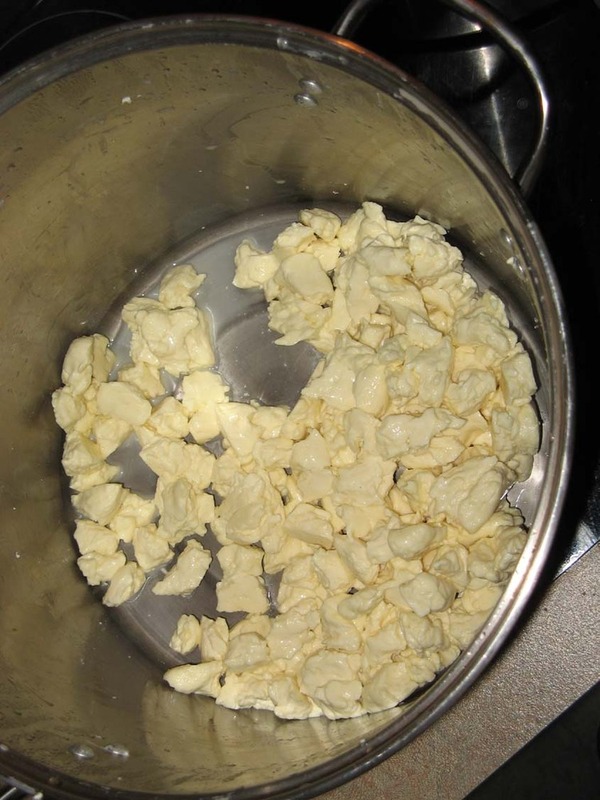 the curds are kept warm and are then ‘milled’ or broken-up. before being weighted down to expel even more water. The moulded cheddar cheese is then dried for several days before the cheese is waxed and then stored for several months to mature in your cheese cave. Here is some cheddar cheese that my sister made earlier. Her ‘cheese cave’ is a cooler bag, with ice brick, kept in the bottom of her linen cupboard (as was suggested by the cheese-making book she uses). It’s official Canberra has fallen under the spell of yet another craze, watching water fall over dam walls!